The one application I would like on my Kindle is a way to take notes easily. No, the keyboard isn't friendly and typing with my thumbs is a pain, but there are times I need to take notes and I already have the Kindle handy. The default notes in the K1 aren't really that easy to use, and save in a bizarre manner (at least the notes save in a text format that can easily be downloaded, but they all save in one file, and there's no proper formatting). The Kindle could definitely use a note-taking app. This morning, a new app was released for the K2 and more recent Kindles that fills that need, the Kindle Notepad. Sadly, apps don't work on the K1, so I'm out of luck. However, I know a couple of people with more current Kindles read this blog, so I urge them to check out the videos and help page and see if it's something they would use. I tortured myself by watching the main video and really was impressed. I'm also impressed by the announcement on the Kindle forum in which the creator answers questions and responds to people's reactions (including mine). Now I have two reasons to get a new Kindle, but I'm going to hold out for as long as possible with my trusty K1. Now that I have used a Kindle, there is no doubt that I will be getting another one when this one dies. 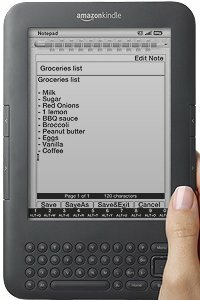 I just hope my K1 ("H-Box") lasts until color eInk is affordable... I'm hoping that the next Kindle I get has color. But this is the first time I definitely want a new Kindle for a specific item, so the makers of Kindle Notepad have managed to really impress me. Did I mention that Kindle Notepad is only $1? I would have already bought it if I had a Kindle that could use it. Heck, I'm tempted to waste a little of my remaining Amazon credit to get it just for the future. That's how impressed I am with it. Thanks for sharing this link - but unfortunately it seems to be down? Does anybody here at realtegan.blogspot.com have a mirror or another source? Which link is down? I linked to five different places in the post, and all of them work for me. Tegan - the comment from "Mark" is comment spam. The plan is basically to post a few innocent-seeming comments so you'll put them in the automatic approval queue, if your blog has such a thing, then they'll start with the viagra spam and suchlike. Just kill it. Maybe someone else will find it and realize they are being spammed. But the real spam will almost never get through (I won't say never, because I have been known to make mistakes). I hand-moderate all comments. Besides, no one posting anonymously would ever get into an auto approval queue.